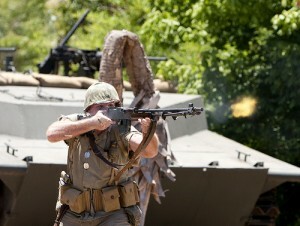 On March 12 and 13 the National Museum of the Pacific War will hold its first Living History Programs of 2011. The program demonstrates weapons and strategies that were vital in the struggle for dominance in the Pacific theater in World War II. Re-enactors use landing craft, tanks, explosive charges, and even a flamethrower to explain and illustrate the equipment and tactics used by the American Army and Marines and the Imperial Japanese Army forces in WWII. The mock battle represents one such battle—the deadly struggle for island of Tarawa. There will be three shows each day (10:30 a.m., 1 p.m. & 3:30 p.m.). The program takes place at the Pacific Combat Zone, which is located two blocks east of the museum complex on East Austin Street between Elk and Lee. Admission to the 90-minute program is $5 for adults and $3 for students. Children under six years of age are admitted free. Tickets may be purchased in advance at the George H.W. Bush Gallery, the Admiral Nimitz Bookstore or online. Tickets are also available at the Pacific Combat Zone on the day of the programs, but due to their popularity, advance purchase is recommended. Admission includes earplugs. The National Museum of the Pacific War is a Texas Historical Commission property supported, operated, and managed by the Admiral Nimitz Foundation.